A friendly comment from "Anonymous" disputed my observation. "You're wrong about Number 8," this person wrote: "It's spring, washer, felt washer then cup washer." I reassemble my oil filter with the spring bearing on the felt washer because that is the way I found it when I did my first oil change. It struck me as odd but, when I experimented by reversing the order so the spring pressure was on the metal washer, I got a leak. Why? 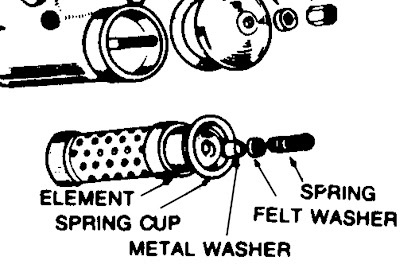 Maybe the spring somehow distorts the way the metal washer compresses the felt, whereas the spring "digs in" to the felt when it is properly installed. The owner's manual that came with my 1999 Bullet bears me out. Here is the illustration, on Page 39.